French Guiana is located to the North of Brazil on the Eastern coast of South America and is one of the least visited countries in the continent. While French Guiana does not have much of a tourism industry as a result, this just means less crowds for you! The cities that the small number of travellers usually visit are the capital, Cayenne, and the smaller Kourou, 60 miles to the North. 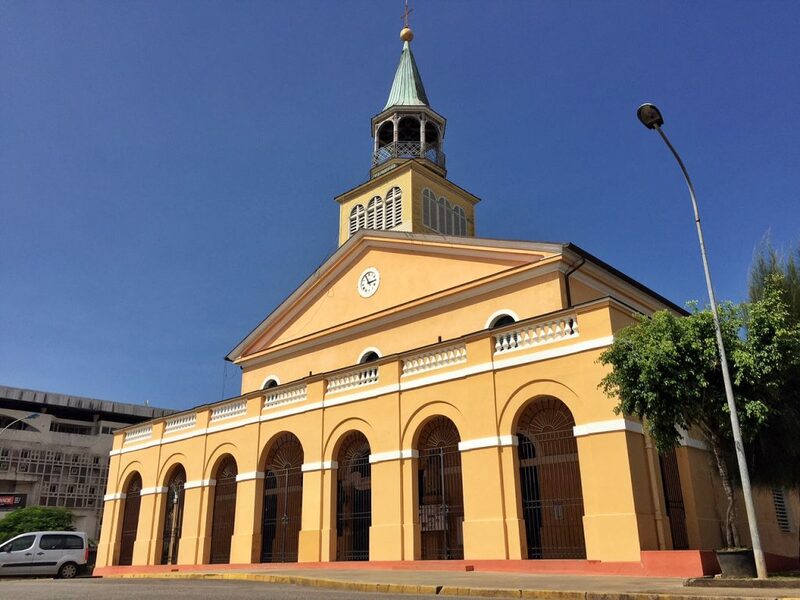 Saint Laurent is the only other major town, located on the Northern border with Suriname. French Guiana is an overseas region of France and the people here are every bit as proud of their French nationality as their homeland compatriots. French Guianese people can travel freely in Europe on their French passport so it is noticeable that the culture here is closer to European than South American. In fact, French Guiana even uses the Euro and there are two flights between Paris and Cayenne every day! Cayenne is a modest city with a busy centre. On week days the city centre is bustling, with people everywhere and shop fronts spilling out onto the streets, but on Sundays the entire city takes a day off and it is hard to find a single shop or restaurant open after 3pm. If at all possible either avoid coming on a Sunday or be prepared to fend for yourself or you will end up eating old biscuits for dinner or whatever is at the bottom of your backpack! This monument was erected in 2011 in memory of the victims of slavery and trafficking. 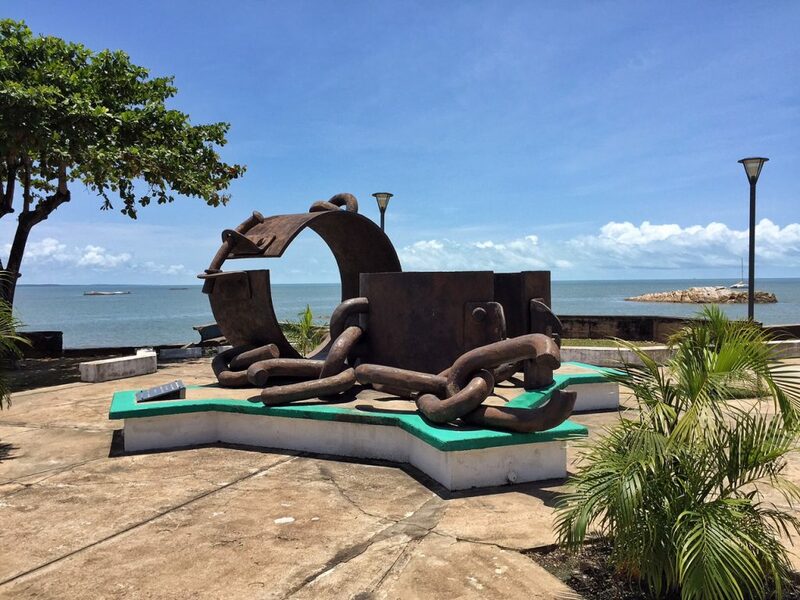 It is located on the North side of the city on the ocean front and is quite a powerful reminder of the origins of French Guiana. 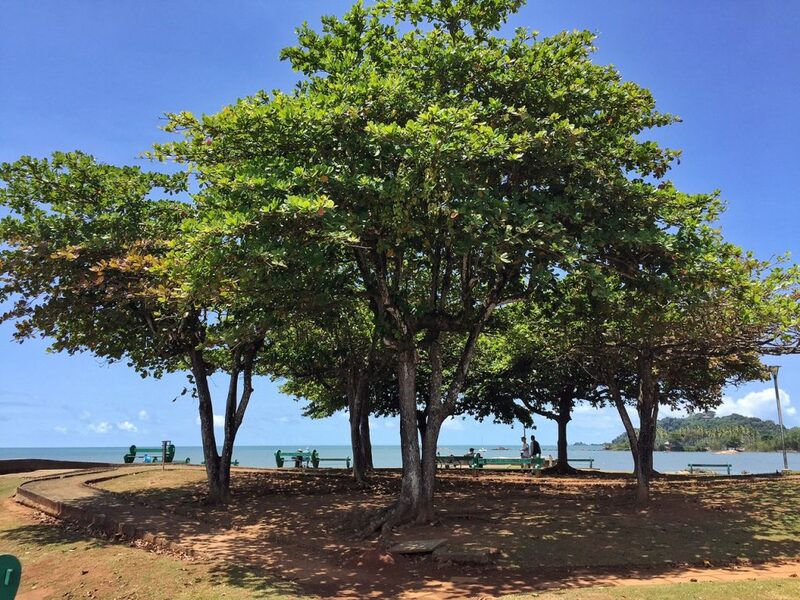 The Place des Palmistes is a park in the centre of Cayenne. There is a statue of Felix Eboue in the centre. Unless there is an event on during your visit you could easily give this park a miss. There is a lovely park at the Pointe Des Amandiers, located to the East of Les Chaines Brisees. It is a great place to just sit back on a shady bench and watch the day go past while fisherman work out on the rocks nearby. There is a bar located at the entrance to the park which is nice for a cold drink. Cayenne is full of interesting wildlife and seeing some of these creatures is one of the best things about Cayenne. Walk outside the centre of the city to came across capybara, families of tiny monkeys, birds, lizards and insects. The cathedral is easily found as its beautiful green bell tower can be seen from almost everywhere in the city. If you go up to the gates you can see some beautiful artwork on either side of the front doors. 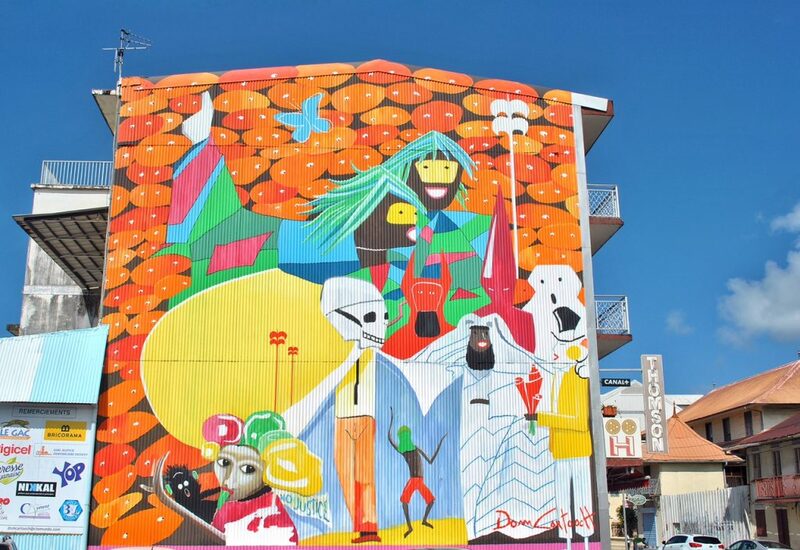 And if you are interested in artwork you will also be impressed by the murals in the nearby city streets. 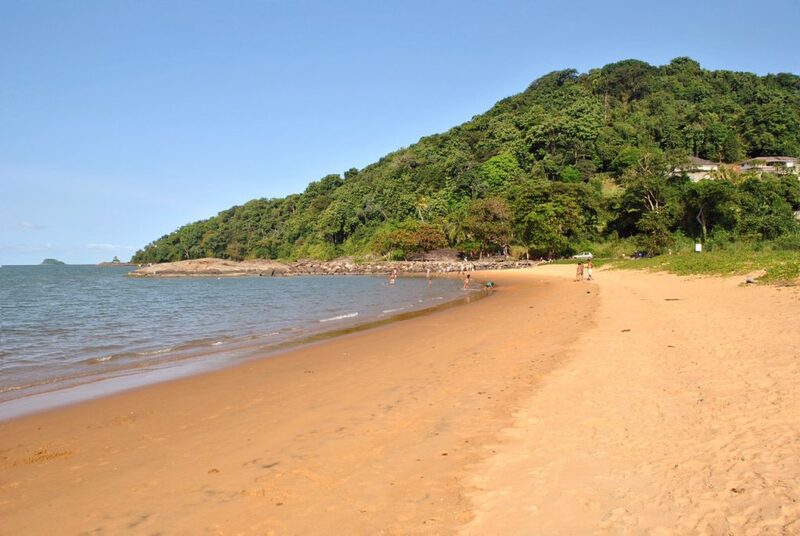 There are many small pretty beaches around Cayenne but you can’t go past Remire-Montjoly Beach. The long wide strip of yellow sand is framed by tropical rainforest which is the home to monkeys and sloths. There are seldom many people at the beach as the tourist industry has yet to properly discover the country so you will probably have half the beach to yourself. Come prepared as there are no shops or bars, so pack a few snacks and drinks before you set off. Then just sit back and relax and watch the day go by as you unwind. The one time of year when you might see some other tourists is Turtle season. Many of the worlds leatherback turtles come to the Guyana region to lay their eggs between April and June and come July/August the little hatchlings make their way down to the ocean. This is an incredible sight to see so it can be worth planning your trip to coincide. Accommodation is one of the biggest hurdles for travellers to the Guyana region due to the low tourism numbers and French Guiana is the worst of the three countries. There are no hostels and the few hotels available are exceptionally expensive. The only way to stick within a tight budget is to stay at an Airbnb. The old saying is true though, you get what you pay for. But then if the bed is comfortable and the air conditioning is cold, what more do you really need! You should be spending your time out exploring, not sitting at home! Cayenne is a small city so the city centre is easily traversed on foot, but there is also an excellent bus service for those further away or tired of walking. There are five bus routes that cover a majority of the city for less than 2 Euros a ride and in the heat of the day this is definitely worth it. 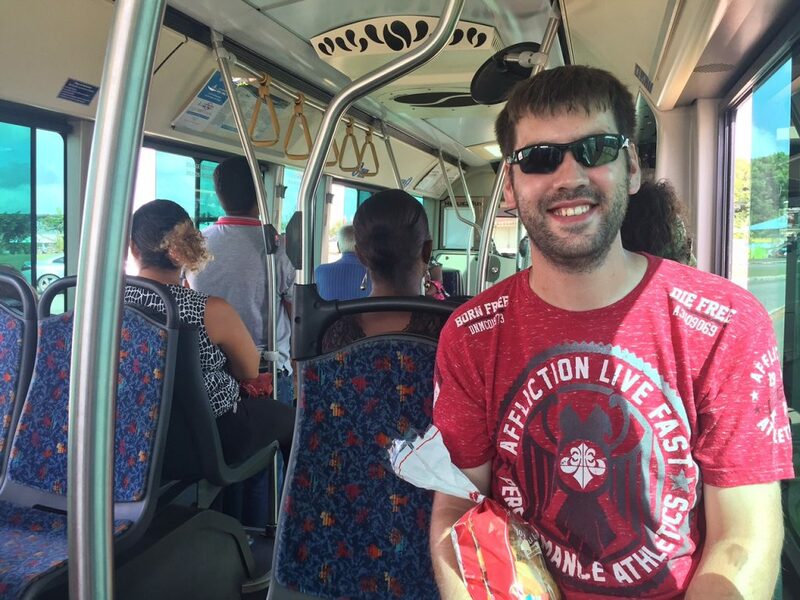 Why walk in the heat when you can catch the bus in Cayenne? 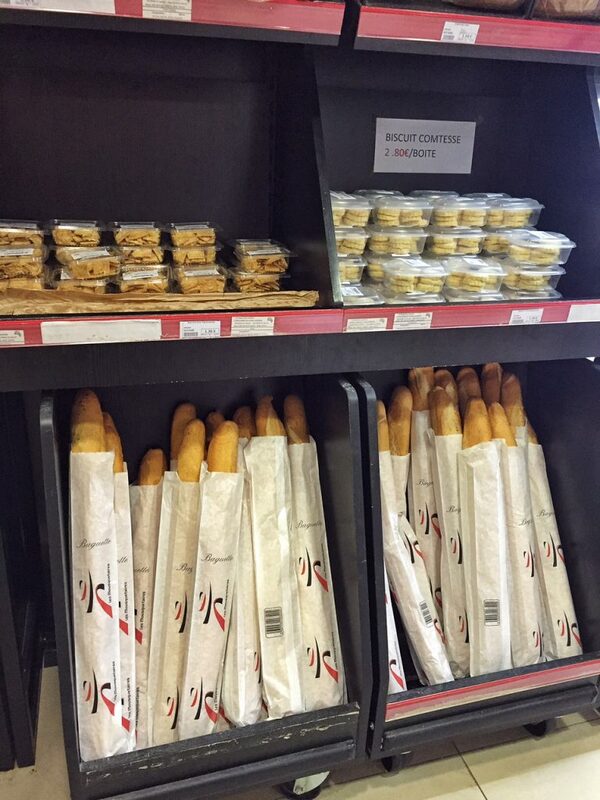 Baguettes, escargot, pastries and cheese! You are essentially in France so eat as the French do. There is delicious fresh bread and French imported cheese in all the local supermarkets and there are French patisseries filled with eclairs, pain au chocolat and croissants. Escargot is available in most general stores for those brave enough to try it. Kourou is a small town located 60km to the North of Cayenne. 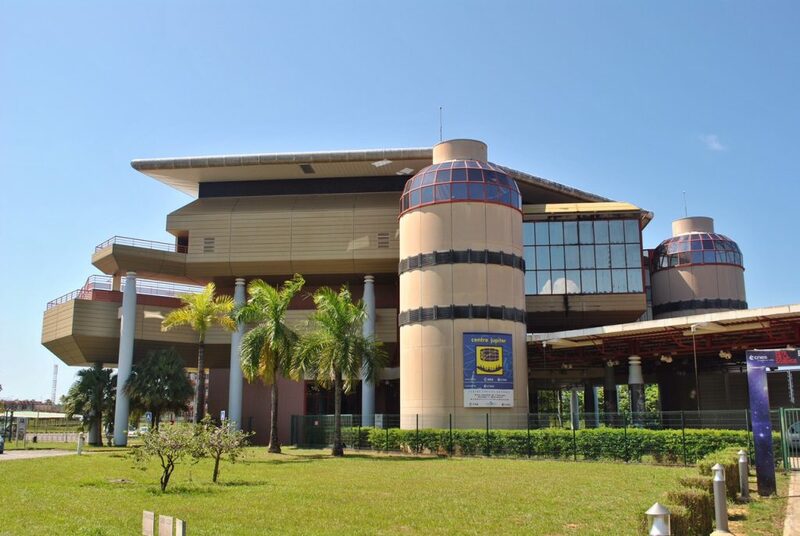 It’s primary draw is the Guiana Space Centre and for this reason there are more services available and it is often preferred by tourists, although it could be argued that it is somewhat lacking in character. 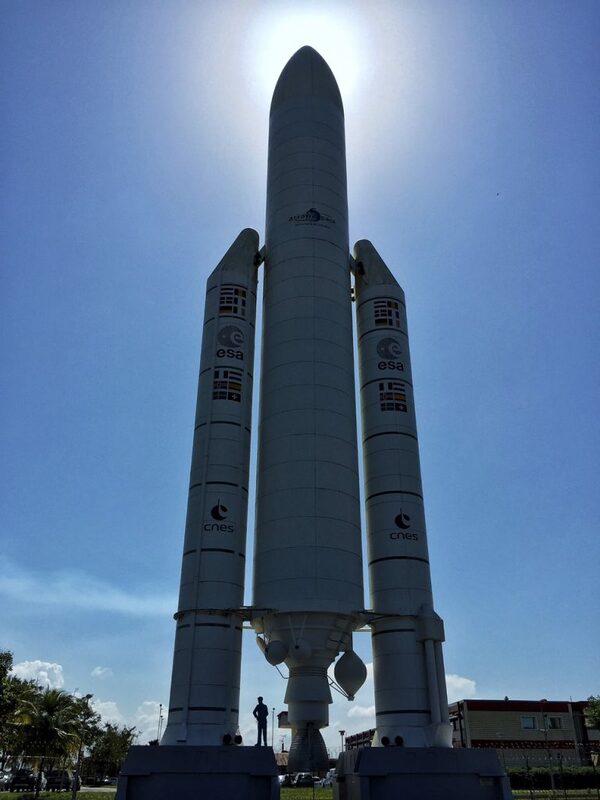 The main reason people come up to Kourou is to visit the Guiana Space Centre. 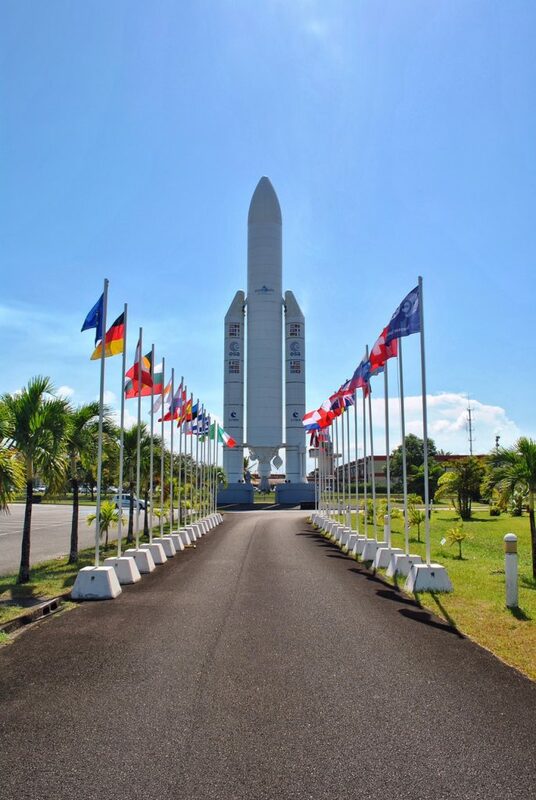 The French space port was constructed here as it is very close to the equator and therefore rocket launches are more efficient due to the sling shot effect from the earth’s rotation. You can go on a free tour of the launch pad most days but contact them in advance to book your spot. The tour is usually in French but they occasionally run tours in English. There is a museum on site which is open most days for a fee. It is an interesting alternative if you missed out on the tour. For a once-in-a-lifetime experience go at the time of a rocket launch. There are registered locations where you can watch the rocket launch from near the city. Refer to the Guiana Space Centre website to find out launch dates and make sure you plan in some flexibility as they are often delayed. Also be aware when planning your trip that the Centre is closed for one week in late August every year so if this is a ‘must have’ activity on your bucket list, then make sure you check your dates before going in August/September. Model Rocket outside the Guianan Space Centre. Watching a rocket launch can be a once in a lifetime experience. While not technically in Kourou the boat departs from the port there. The islands are located about 70 kilometres off shore and the tour to the island takes a full day. Devil’s Island was the home to one of France’s most notorious prisons which was in operation until the 1950’s. The islands were made famous by the film Papillon which depicted the escape of convict Henri Charrière. While the actual prison island is off limits you can visit the two nearby islands, Île Royale and Île Saint-Joseph, which house some ruins and a small museum. The best way to get to and around Kourou is to hire a car. There are many car hire companies in Cayenne including Sixt and Europcar. Car hire can be expensive but it lacks the frustration from waiting for crowded buses to leave and once you get to Kourou there are no regular busses to the Space Centre. Driving is relatively safe as the roads are not busy and the driving is not difficult. Be aware that they drive on the right side of the road and that speed cameras are used in French Guiana, but most of all enjoy your trip!